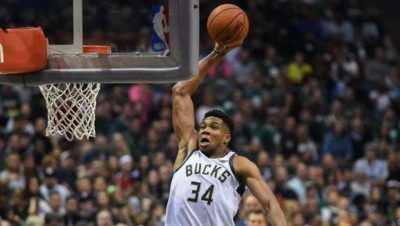 Milwaukee is at the top of the NBA, led by Giannis and a solid roster. Behind, Toronto, Philly and Boston have the firepower to get that top spot despite too many disappointing losses. Since December 23, the Bucks lost only two of their last thirteen games, respectively against Toronto and at Washington (without Giannis). Against Toronto, Giannis’ 43pts and 18rbds were not enough to stop Ibaka and Siakam (55pts on 22/32). Lopez’s lack of toughness was exposed as he only scored 5pts and grabbed 2rbds in 24min. Apart from this game, Milwaukee has benefited from a pretty light schedule but has also been able to beat Houston away from home (27pts 21rbds for Giannis, 24pts for Brogdon). Mention to Bledsoe who is averaging 21pts 5.8as for only 0.4to over the last five games. The Raptors are just two wins behind Milwaukee but they’re far from being the most consistent team. Loss by 29pts at Orlando, by 18pts at San Antonio and short wins against Atlanta (+3) and Phoenix (+2) at home. At least, they have been able to beat direct rivals Indiana and Milwaukee at Milwaukee and were in the game until the last two minutes against Boston despite shooting only 7/29 from three. What Toronto has been lacking the most is throwback center Valanciunas as in every game they lost recently, the opponent’s center did dominate (24pts 7rbds Horford, 23pts on 9/12 Aldridge, 30pts 19rbds for Vucevic). Over the last month, right after an ugly 92-91 loss against Cleveland and a more respectable loss against Toronto (without Ibaka), the Pacers have lost only three of their last fourteen games. The problem is that they lost all games against their Eastern Conference’s opponents and by a wide margin, 24pts against Philly, 27 against Boston and 16 against Toronto without Kawhi. In those games and since he came back from injury, Oladipo has been struggling, averaging only 17.5pts on 40.5% FG. The Pacers’ leader will have to step up his game if he want his team to stay in the top four and grab a home advantage in the first round. In what seemed a pretty light schedule in the first half of the season, the Sixers have let slip away too many games, like the back to back losses against Washington and Atlanta. In their last game, Philly struggled against the NBA’s most suffocating defense. Despite good perfs from Embiid (31pts 8rbds 6as) and Simmons (20pts 15rbds 9as), the Sixers couldn’t count on Butler who scored 18pts but on an awful 5/18 from the field. In the next month and a half, Philly is going to play Denver and Golden State twice and will have other difficult matchups against the likes of Houston, SA, Toronto, Portland, Boston or OKC, definitely the most important part of their schedule before an easier late regular season. Two three-losses streak against Detroit/Phoenix/Milwaukee and more recently against Miami/Orlando/Brooklyn is not the best way to reach the top of the Eastern Conference standings. In the latest streak, Horford struggled as he averaged only 6.7pts and 5.7rbds before bouncing back with 24pts against Toronto. Hayward was even worse during the streak with 5.7pts on 33% in 23min. Since then, Irving has been on a tear with 32pts 11.3as on 61% FG. Boston will be teste in the two upcoming weeks against Golden State and OKC. After an eighth loss in a row against OKC on December 6, Brooklyn benefited from an overtime win against Toronto and an easier schedule to flip the script of their season with 16 wins and 5 losses since then, includinf recent victories against Boston and Houston. D’Angelo Russell has been hot in January with averages of 23pts 7.4as on 50% FG including 44% from three. Inside, Allen has been on a a tear with 13pts 12.6rbds 3.2bl over the last five games, including a 20pts 24rbds game in the win against Houston. After five straight wins, including wins against Houston and Milwaukee, Miami has been as inconsistent as possible with victories against Toronto, Denver or Milwaukee but losses against Atlanta or Detroit. After struggling much of his career wth consistency, Justice Winslow has found a way to bring steadiness to the table with at least 11pts in each of his games in January and two 10+as games, including a 13pts 11as 7rbds 1to in the win against Boston. Charlotte will have to make choices. As usual, the Hornets are fighting for that eighth seed in the East, depending mainly on Kemba who has been the best scorer in 14 of the last 15 games. As the trade deadline is getting close, trading Kemba seems the best solution, both for the franchise and for the Bronx native, to bring talented pieces or future draft picks to rebuild in North Carolina. Next Next post: 2019 NBA Mock Draft #4 : Is talent superior to need?